Today, we focus on the situation within South America. From the chart below, it can be seen that in Colombia and Argentina (whose populations rank second and third respectively in South America) chronic obstructive pulmonary disease or chronic respiratory disease were among the top five causes of death. Further data also shows that in countries with high populations and per-capita GDP such as Brazil, Chile, Cuba, Peru, Mexico, Uruguay and Venezuela, death caused by chronic obstructive pulmonary disease (COPD) are also ranked in the top ten. The situation is equally grim within China. Data from previous analyses show that COPD ranked as the third highest cause of death. Nanshan Zhong, director of the Guangzhou Institute of Respiratory Diseases and academician of the Chinese Academy of Engineering, pointed out that COPD has become the third leading cause of death after cancer and cerebrovascular diseases. However, because there are almost no symptoms in the early stages, people are generally less aware of the disease and often ignore or even pass the necessary tests. Currently, regular pulmonary function tests are still the simplest and most effective screening method for COPD, and make it a habit to regularly test for the disease in the same way that we regularly test blood pressure. 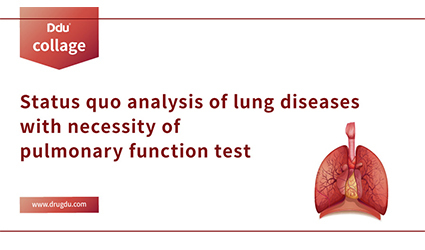 Regular pulmonary function tests are one crucial to detect respiratory diseases. It is mainly used to detect the patency of the respiratory tract and lung volume. For early detection of lung and airway diseases, assess the severity and prognosis of the disease, assess the efficacy of drugs or other treatment methods, identify the causes of dyspnea and diagnose the positions of lesions. It has important clinical value in assessing the tolerance of lung functionality for surgery or labor intensity tolerance and monitoring of critically ill patients. In the not so distant past, we had to go to the hospital for regular pulmonary function tests via a large pulmonary function meter. 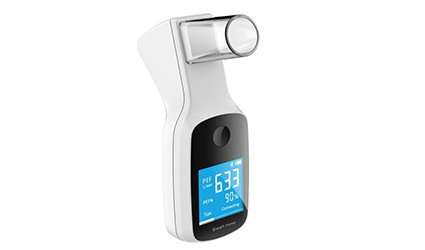 Nowadays, there are a variety of portable lung function meters on the market which is convenient for real-time measurement at home. 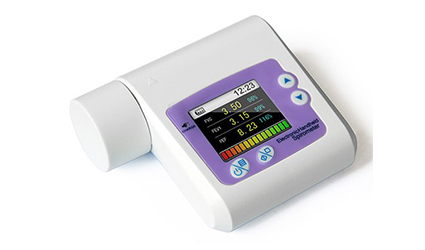 Below are two portable lung function monitors available in drugdu.com.